I think the post title pretty much says it all. On July 22nd the Minnesota DNR announced a new Sandhill Crane hunting season under "Expedited Emergency Game and Fish Rules". They did this to deal with the, um, well, sandhill crane emergency. You can now kill up to four cranes by paying a measly $3.00 administrative fee. That comes out to 75 cents per crane. No hunting license or stamp is required. You can download the entire three page rules here. That's some good economics from a state that just announced a 99 million dollar shortfall in tax collection and is sure to face a budget deficit in the next legislative session. Large amounts of money have been spent to restore crane populations and now you can kill them for 75 cents a pop. What a deal. The regulation actually reads that you may not have more than four in your possession so I suppose if you eat them fast enough you can kill as many as you want for your $3.00. How does this make any sense? A lot of the outrage out there stems not from the giveaway but rather from the secretive process the DNR used to bring this hunt about. There were no public hearings, they didn't seek public input in any way, they didn't consult the legislature and they announced the hunt just weeks before it was to start, in the middle of a busy summer, and after the legislative session. Now I'm not opposed to hunting. I think it can be one of the most environmentally responsible and sustainable ways for humans to obtain meat for their diet. This is a missed opportunity though. Hunters have done more than any other group for wildlife preservation through the duck and waterfowl stamp programs. Not even looking at the wildly successful federal duck stamp program, according to the Minnesota DNR's own website the Minnesota Waterfowl stamp has raised $15.7 million over the past 30 years for habitat restoration and preservation. Why not a crane stamp to support similar programs? The DNR has missed the boat and further alienated the public they are so afraid of talking to with this latest move. 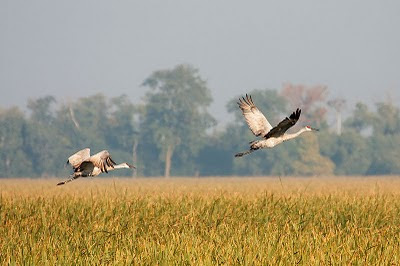 Audubon is urging citizens to express their concerns about the lack of public involvement in the decision to allow sandhill crane hunting, from September 4 – October 10, across 10 counties in northwestern Minnesota. Audubon has made it easy to contact Commissioner Holsten by simply clicking the link below. You can also do it yourself. I saw the migration on the Platte for the first time last March. I cannot imagine killing them.